The sale of the Guennol Lioness - "said to have been found at a site near Baghdad" and displayed at the Brooklyn Museum since 1948 - at Sotheby's in New York this week for US$57.161 million has captured attention. 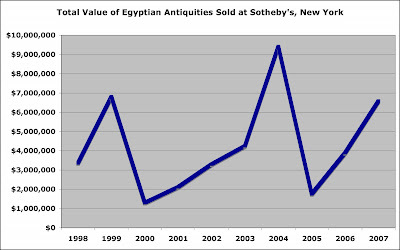 But this is the third best year since 1998 for the sale of Egyptian antiquities at Sotheby's with a total of US$6.586 million in 2007. First place is 2004 with US$9.414 million, and second is 1999 with US$6.811 million. Egyptian antiquities now represent 16% of the total sales of antiquities for the period 1998-2007 fetching some US$42.826 million. Antiquities in general - and that includes the Guennol Lioness - have raised some US$216.306 million for Sotheby's. And what are the sources for these Egyptian antiquities? Just over 95% lots have no stated find-spot. And some 68% were first known after 1973. Figures revised in December 2008. Out of curiosity, where did you get the statistics of artifacts known after 1973? I am trying to track down some tomb scenes looted after the mid-60's and have been trying to find sources on activity in just that period. The figures are derived from a study of the lots offered for auction in the period 1998-2007. The study follows standard Gill and Chippindale classification as used in our study of Contemporary Collecting. We used 1973 to coincide with the AIA resolution of that year.